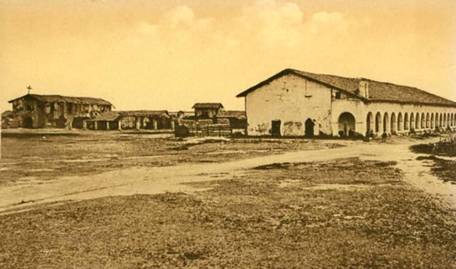 Mission San Fernando Rey de España was founded in 1797, the seventeenth mission in the chain. The location in San Fernando was a prime spot, along the main highway leading to Los Angeles. This made it a convenient resting place for weary travelers. After the first buildings were completed, more and more buildings had to be added to accommodate the large numbers of visitors looking for lodging. The Indians were friendly in the area and during the most prosperous time, over a thousand converts lived at the mission. Good soil and abundant water in the valley provided great potential for good agricultural development. Although a bounty of olives, fruits, nuts, dates and field crops were produced by the mission, the development of agriculture did not prove to be as successful as originally hoped. The mission has been through a turbulent history of politics and power struggles. The buildings gradually fell into disrepair. Today, the mission is being restored and is a pleasant and fascinating place to visit.